The paper was so busy that I was not sure how to create a page layout with only one photo and still make it seem like the story flowed in the album. So I used the lined paper for the wall paper (or background), then I used a decortive trmmer to make the four strips that are wavy. I matted the four strips with plane colored cardstock and then placed another design print on top. Make sure that when you are doing this you use the same curves so that the paper will match up and the curves are going in the same directions. Then I matted the photo three times. First mat the photo with cardstock that matches closes, second mat with the designed paper, and third use the same color cardstock again. You can use another cardstock if you choose, I just thought there were enough colors already in the layout. I placed the two twelve inch decorative strips together one horizontally and one verticallly, crossing over each other in the center. I took another strip and cut it in half at the ends I angled and cut again making it look like ribbon and placed the photo that is matted over the center and make sure only the ends of the of the strips are hanging out making it appear to have a ribbon effect. 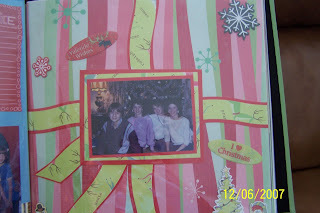 Once I completed all this I added the embellishments that I felt went with the layout. If you lie you could omit this step being that the paper is busy. It is totally all your choice on how creative you would like to be.